Posted on January 3, 2012 by Molly Tagged Blog Postdieteating healthyfoodHealthingredientsnaturalweight losswhole foods	Comments2 Comments on Are you eating real food? So how hard can eating real food be? I started my quest to begin eating only real food about a year ago and at first I quickly found that it was not as easy as I thought it would be. Going to a grocery store nearly every single food item is processed with tons of additives, preservatives, artificial flavorings and chemicals. For example, trying to find an honest whole wheat bread was harder than I thought. I went through the entire bread isle and did not find a single loaf of bread that was a “real bread”. 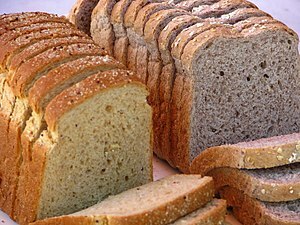 Most loaf’s of bread had more than 30 ingredients. Maybe 4 out of more than 30 were recognizable as food but the rest of the ingredients consisted of things like “dough softeners” and unpronounceable names. I think that everyone deserves to able to eat something that is real and that is fresh. A lot of the things we find in the grocery stores are more like a product of a lot of chemical engineering not food. Eating all these chemicals in our foods everyday damages our bodies and its ability to process these fake ingredients. There is also a lot of hidden sugar in a lot of the foods in stores and sugar is one of the worst things for our health. I will be writing more in detail about the effects of sugar in a later post. I have stopped eating sugar all together with the exception of fruits. Fruits contain natural sugar and it is processed much slower than other sugars. If you want to eat healthier and more natural my advice it to always go for foods like fresh produce, and try to buy foods with less than 5 ingredients. A good rule to keep in mind is that if it can go bad fairly quickly then it is good quality food. Also I like to buy my groceries from farmers markets or whole foods markets since they have guidelines on what they sell in their stores. Now I am not saying to become extremely religious about this, but it is a good point to consider if you’re trying to eat healthier or lose weight. When you make a choice to eat more natural foods, your health improves greatly, your skin looks better, you have more energy and weight loss becomes easier. It does not have to be something drastic, just making small efforts here and there can make a huge difference.